Contact Info: Message me on DW if you want to get ahold of me and don't know me. Otherwise, if you ask for my e-mail, I'll give it to you, as long as you're not a random stranger messaging me out of the blue. personalapocalypse is my comm on DW for most of my fannish things these days. Easier to keep track if I keep most of them there. theoreticalconstruct is my tumblr. More often than not I just reblog things. Wallwalker is my AO3 archive. Most of what I've written in fandom is there. It's a bit odd so far. Apparently you can just... code and save things and it'll automatically update the app. I'm not used to that. I have a little project that I've been working on, to continue building a webapp for a school project. This would honestly have made that project much, much easier, and I might just convert it over for ease of use. I feel like I'm still so far behind. I'll probably post more thoughts on it later. Every month I say, "Okay, on the first of this month I'll start writing/drawing daily to catch up." Then I realize it's been a week since the first of the month and that I'm far behind again, so I just shrug and say, "Okay, I'll wait another month then." It would probably help if I knew what to write/draw at the moment. One reason I've been asking for prompts. Join us at rainbowfic to write some sweet Valentine's Day and Family Day original flash fiction. Contest runs from February 14th (today) to February 19th. Signal Boost: New Meta Newsletter, Signal Boosting, Linking, Dogpiling, and History. The place I'm coming from, personally: I'd like people to talk to about Thing I'm Currently Most Interested In (hereinafter known as Thing), and I would also like people interested in talking about Thing to come talk to me. As my profile says, PLEASE DO link my posts around, to each other, to newsletters, to outer space (unless I'm currently writing NASA RPF, then please don't link it to outer space). That will mean people are more likely to come talk to me about Thing. Also, link to your own or other people's posts about Thing, so I can find them! We shall all talk to each other in an unending comment party that is completely unlike kd lang's cover of "Heaven." The flip side of that, however, is when you're linking to something you think is Wrong On the Internet (hereinafter known as Wrong). There's been a lot of talk about monetizing fanworks recently. I haven't been able to participate in the conversations, but it's something I think about a lot. One, I don't think it's all that different from the past. It's just easier now. There's more of an infrastructure for it - but I've been on the net since the early nineties and I've always seen the occasional tip jar/PayPal link on the sites of writers, artists and such. Two, I don't think it's just plain monetizing, not like multi-level marketing schemes (which is one comparison I've seen.) I don't doubt that some people use Patreon and similar sites as ways to monetize their relationships with others, but I think they're in the minority. I think that for the most part they are ways to ask for help without feeling like they're begging. Asking for help is difficult, even among friends and family. Having something that makes it feel less like desperation and more like an actual thing you can do for them in return? That helps a lot. I want to post more about programming, because I'm still trying to trace a program and figure out HOW it works to find all r-combinations of a n-set without repeating any combinations. It clearly works, but I want to know why. I need to be practicing programming challenges because of job interviews and the like, because I have more interviews coming up and I don't want to have another experience like the last technical interview that I tried. Is this ADD? I still don't know. I don't know why, but I'm getting this error when trying to reply to some of the posts on my access list. I've never seen it before. I will probably have to talk to the support team soon, see if I can get a response. So robin_iamar had a good idea for doing some fun fic stuff in February and I think I might do something similar. I may post on personalapocalypse and take requests for meta/ridiculous story ideas, if anyone would like to participate. ETA: It helps when I spell things right, doesn't it? Also, if anyone has worked out a way to make a queue for DW similar to the one on tumblr, please let me know, because that's the one thing that I really miss about tumblr. I'm feeling moderately better. Did a couple of challenges. Am going to retry them eventually... see if I can't do them from memory later. I figured I'd make a few notes to help me later. My professor complained about the cheating in our classes, and how employers are getting back to him and saying that it's resulting in students that are unprepared for employment. I never cheated. I can honestly say that. If I couldn't finish my homework in time, I just didn't turn it in. And I still passed the class in which I learned Java with a B. That was 2016. I'm looking at an easy challenge on a coding site. I've been staring at it for thirty minutes, trying to write code, getting really weird errors. I'm starting to think that I should just give up - if I can get a 3.5 GPA without cheating and still not be able to do what should be easy, then I'm not cut out for this. But then again... if I don't do this, I've wasted another five years. It's. It's just been a rough night. Keeping track of some of the interview questions I've seen/been told about, for reference. When to use certain data types. Once I can upload all of my art, I want to include some of the art I started drawing last year as well. It's a longer list than I remember, and I already have a few new things to add. So if you wanna read some of my older stuff, go for it. Rebooting as of January 2, 2019! 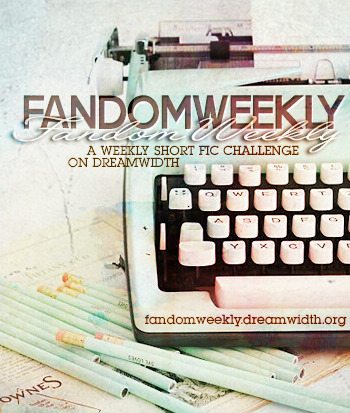 fandomweekly is a multifandom weekly writing challenge community open to both fandom and original fictions, where participants write and submit a short story (1000 words or less) based on a given prompt. Readers vote at the end of each round for their favourite submissions to decide the winners. Each challenge has two unique elements: a Weekly Theme and a Bonus Goal to meet. New challenges are posted every Wednesday! Still no luck with gainful employment. Just trying to keep my mind working, is the important thing. It's easier said than done, I spend a lot of time being tired and a lot of energy on doing things anyway. But I have to keep going! I have part of a post that I mentioned before typed up (the one about the medical equipment and software bugs being a bad mix,) but parsing the technical problems is more difficult than I remembered so I'll keep working on that. I'm probably going to start posting nerdy commentary about programming and similar things here, just to try to make sure I'm spending a bit more brainpower on it. I had a large post started about one of the cautionary tales about sloppy programming that I studied this past year, the Therac-25. (It's a medical device, a linear accelerator, and the errors in programming resulted in some pretty terrifying things. I'd post it under a cut, because it's really hard to read if you're squeamish about medical mistakes.) It wasn't very technical, and I lost it because I didn't save it to a file. Might rewrite it later, since it's a good reminder not to be sloppy with important code. Sometimes I don't think I can be technical about these things anymore. I know that it'll help when I'm not so tired from lack of caffeine. Just have to keep at recovering. I haven't been doing much for rainbowfic, and I want to sign up for getyourwordsout this year because I need to keep myself occupied.... guess I should combine the two. Also I got this from here. Guess I just have to stay awake enough to do things now. Lack of caffeine is rough after being used to it. I might need a week or so to get used to not having any. My inbox on this site is currently full of posts from a community that I've been trying to untrack for some time now. Finally submitted a support request today. Commencement is tomorrow, but I'm not going to be walking in it. I don't see the need; I've already been through one. Just gonna get my diploma soon, and keep looking for a job. Not already having a job is just... it's draining on me. But I have to try. College has my sleep schedule just... hopelessly weird at this point. I'm going to have to change it if I'm going to get a full-time job. But then again, I think that if I have stuff to do, I won't feel the need to nap quite as much. Anyway. Any of you ever heard of YAML? I'm trying to learn it now. 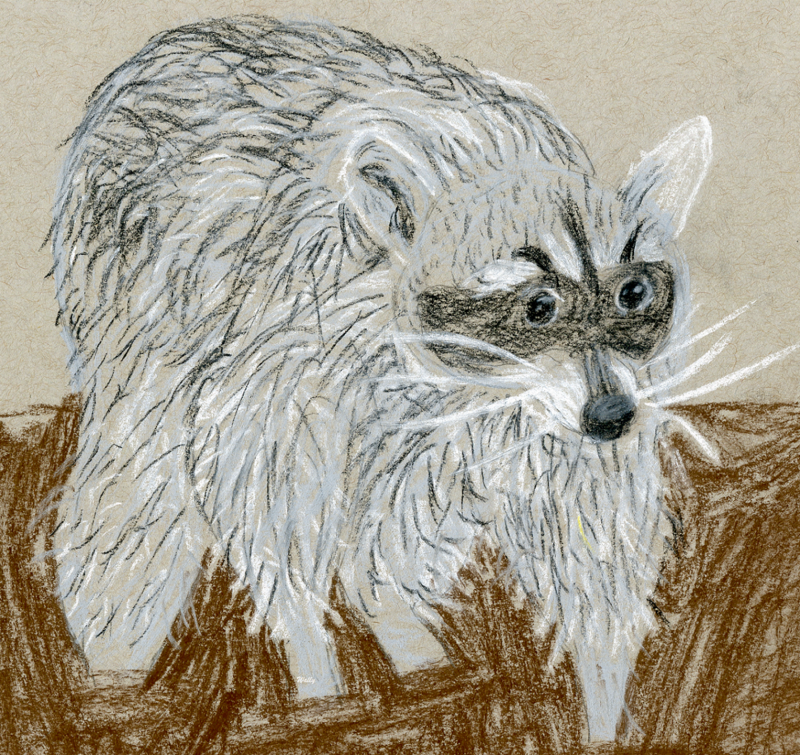 Practice sketch of a raccoon from reference - a warmup for a raccoon lawyer. His little paws are buried in the mud. Conte crayons on gray paper.